The Silver King (aka Tarpon) has arrived. The months of May and June bring the Tarpon migration to the Tampa Bay area. 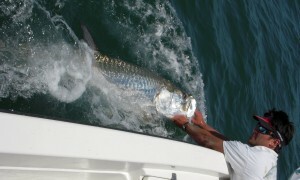 There are different ways to fish Tampa Bay for Tarpon. The areas bridges hold fish all season. Heavy tackle is a must to be successful in landing a Tarpon around the structure the bridges have to offer. It can be very challenging to land a fish but also very rewarding. Beach fishing is another way to catch a trophy size fish. We search the beach for schools of Tarpon and try to present bait ahead of the school and let the fish come to the bait. This technique requires an early start due to the boat traffic. Once the boat traffic gets heavy, the fish shut down. Another technique is to fish Tampa Bay’s area passes. Fish will gather in our passes and feed on the bait that is flushed out of the Bay. We drift the pass with live bait and wait for a taker. If you are looking to experience the thrill of a 150lb Tarpon jump 6’ in the air while hooked to your rod, book a Tampa fishing charter now!